(iii) Continues its internal review of the suspected or attempted financial exploitation of the eligible adult, as necessary, and reports the investigation’s results to the Agencies within seven business days after the requested disbursement. (b) fifteen business days after the date on which the broker-dealer or investment adviser first delayed disbursement of the funds, unless either of the Agencies requests that the broker-dealer or investment adviser extend the delay, in which case the delay shall expire no more than twenty-five business days after the date on which the broker-dealer or investment adviser first delayed disbursement of the funds unless sooner terminated by either of the agencies or an order of a court of competent jurisdiction. (3) A court of competent jurisdiction may enter an order extending the delay of the disbursement of funds or may order other protective relief based on the petition of the commissioner of securities, Adult Protective Services, the broker-dealer or investment adviser that initiated the delay under this Section 7, or other interested party. Section 7 provides broker-dealers and investment advisers with the authority to delay disbursing funds from an eligible adult’s account if the broker-dealer or investment adviser (or any qualifying individuals therein) reasonably believes that such disbursement will result in the financial exploitation of the eligible adult. The broker-dealer or investment adviser shall direct that the funds be held in temporary escrow pending resolution of the disbursement decision. If a disbursement is delayed, notice must be provided within two days to all persons authorized to transact business on the account (unless any such person is suspected of financial exploitation) and to the state securities commissioner and APS agency. The broker-dealer or investment adviser must also undertake an internal review and report the results within seven days of the requested disbursement. [i] The Committee considered some commenters’ suggestions that the Model Act allow broker-dealers or investment advisers to delay the actual execution of transactions, but concluded that holding funds in temporary escrow would be preferable policy and, furthermore, that delaying executions could be inconsistent with applicable federal laws and regulations governing the execution of securities transactions. FINRA Rule 2165 also applies only to holds on disbursements; in that regard the NASAA Model Act and the FINRA rule are consistent. [i] As initially proposed, the Model Act would have permitted an initial disbursement delay of 10 business days. 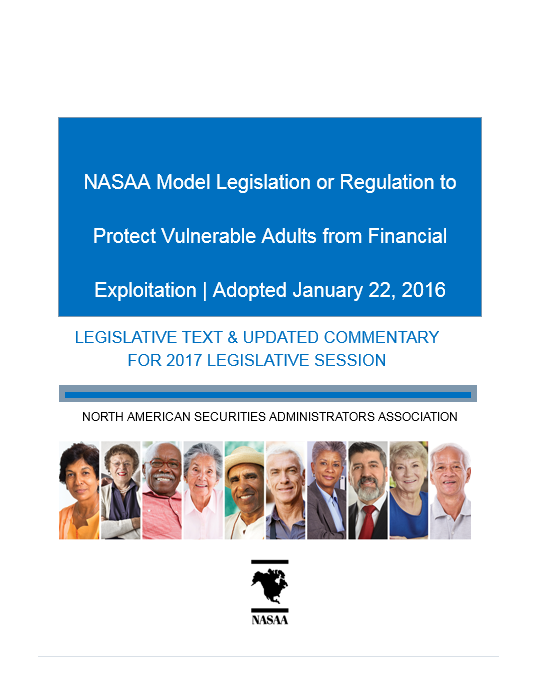 The Committee increased this initial disbursement delay from 10 to 15 business days in the final version of the Act following public comment because a longer period would provide more time for broker-dealers or investment advisers to review the suspected financial exploitation. Section 7(1)(a) clarifies that a firm must conduct an internal review of the facts and circumstances in order to have a reasonable belief that financial exploitation may occur. Section 7(1)(b)(iii) clarifies that a firm must continue its review or investigation following a delayed disbursement and must report the results of that review or investigation to the Agencies. The Committee considered but declined some commenters’ recommendations to add a provision relating to governmental investigations. The Committee declined to expand the delay beyond a total of 25 business days (an initial 15-day delay at the firm’s discretion, followed by a potential 10-day extension at the request of a state securities regulator or adult protective services office) in view of comments from consumer advocates noting the potential harms investors could face if disbursements are delayed too long, such as bounced check fees, missed bill payments, and other financial hardships.